"You will not believe what we collected,“ shouted an exasperated 20-year old Mushfiq while cleaning his hands with Hexisol. “I could not have imagined people dump so many things in the lake - it's unbelievable!” It seemed Mushfiq wasn't the only one who felt that. On 25th March, everyone surrounding the lake (Mohakhali ghat) and wearing extremely dirty white t-shirts resonated his reaction. How could they not when they had spent the past 9-10 hours cleaning one of the most ecologically critical lakes in Dhaka city (as declared by the government in 2001)? The Baridhara-Gulshan-Banani Lake sits at the crossroad of the posh urban structures and low-lying, crammed slums. Although identified repeatedly as a pothole of illegal activities, particularly haywire garbage dumping and sewage sludge from surrounding residential areas, it has failed to mobilise the government into taking serious actions. Pathways have been built and a recent agreement between DFID and the government is in the picture, yet very little has actually been accomplished in response to the plight of lake ecosystem. 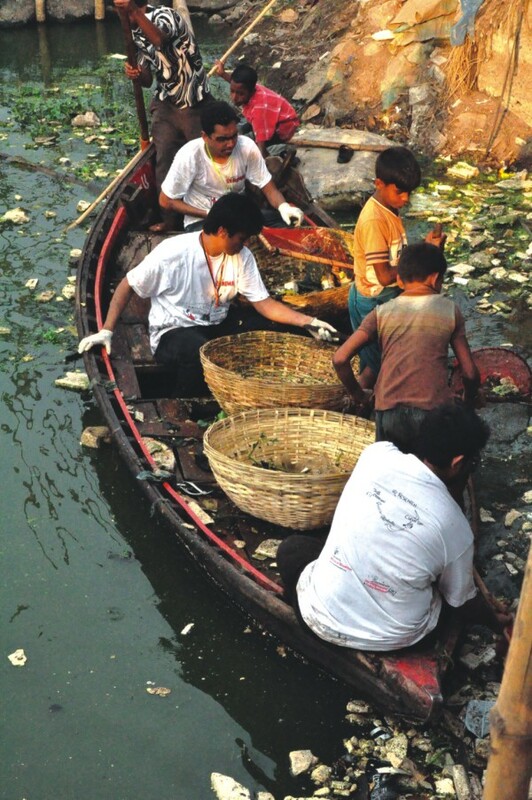 Boatmen have often complained how incessant accumulation of solid garbage has made manoeuvring their boats difficult, while the surrounding slum community has bickered about unhealthy living standards. Research conducted through surveys and examining water samples by House of Volunteer (HoV) at BRAC University and Mr. Mahboob Hassan from the Mathematic and Natural Science (MNS) department respectively have shown the highest count of bacteria (more than Buriganga!) from this lake, especially in the portion at Mohakhali opposite to BRAC Inn. Clean lakes have become a necessity, not only to prevent rampant breeding of mosquitoes (leading to diseases), but also to ensure safer living standards and mobilising economic activities. In response to the call for cleaner lakes, some youth organisations have decided to take matters into their own hands. One of the most remarkable of this lot of endeavours was Project Renewal, organised by House of Volunteer (Hov) at BRAC University (www.houseofvolunteers.org) in partnership with One Degree Initiative (www.1di.org) and Finding Bangladesh (www.findingbangladesh.com). The project offers a comprehensive attempt at understanding the demand of cleaner lakes, coupled with an extensive lake clean up exercise by young volunteers. This is to be followed by workshops on making recycled paper using water hyacinths (kochuripana) and used paper, thus leading to sustainable, income-generating incentives to keep lakes clean - amongst both wealthy and economically challenged population. In completion of the first phase of surveys and paper making workshops, the teams of volunteers from all three organizations joined strengths on the 25th of March this year to get down into the water and get really dirty. On the much anticipated Friday morning, nearly 150 youngsters were found buzzing around the lake, particularly at the region in Mohakhali that recorded as most toxic and vulnerable. Gloves, white t-shirts, masks and bostas in hand, they were assigned into smaller teams with specific tasks in the more elaborate lake clean-up activity, thus increasing efficiency in the process. From 7am onwards, they picked, shovelled, soaked, rolled, rowed and floated in boats surrounding embankments collecting solid waste and kochuripana. By noon, they have had the experience of a lifetime! 10-year old Rasel, a local slum-dweller and one of the kids who were thrilled with the bustling of activities in the place they have lived since birth had a more interesting story to share. On that note, a job well done! Areas of the lake were relatively cleaner at the end of the day, and having collected over 600 bostas full of garbage, volunteers knew how important it was to keep our environment clean. While the organisers gear up for another round of paper making workshops and plan towards future phases of the project, today's youth go home with some very important lessons.